I don’t know about you, but for me Monday is the busiest day of the week. even though I work from home, the bulk of my assignments come in over the weekends or on Monday so I spend most of the day doing research and writing, trying to get as much done as I can. this often means that Monday tends to be a leftover day or one where we have made something for dinner the night before and can cook it quickly and easily Monday night. this recipe for today could really fit into either of those categories. It is easy enough to do with leftovers right on the spot or you could put it all together the day before and simply heat it up for a great meal. The idea for the recipe comes from MyRecipes.com, but I did change it a little bit to fit my needs since their original version is designed to be cooked when you are camping and cooking over an open flame. 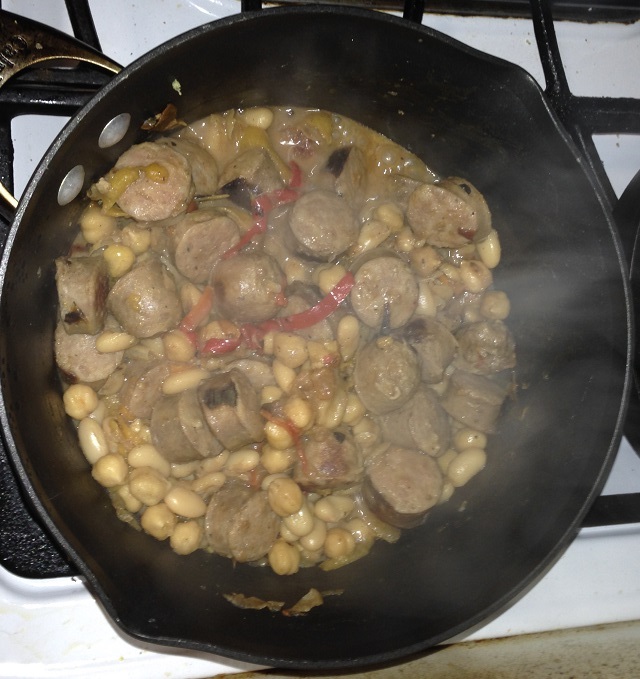 I changed it slightly to fit into a nice, home-cooked meal of an easy sausage and bean Dutch oven stew. In a Dutch oven set over medium-high heat, add the olive oil and heat until it is shimmering. Add in the red pepper, yellow pepper, orange pepper, poblano or jalapeno and the onions and saute until the vegetables have just softened, stirring occasionally, about 3 to 4 minutes. Add the chopped garlic and heat until the garlic is fragrant, about 30 seconds to 1 minute. add the cannellini beans and chickpeas, the rosemary and the Italian sausage pieces, along with 3/4 cup of water, and stir until the mixture is incorporated. Bring the mixture to a boil and reduce the heat until the stew is simmering. Cover the pot and continue cooking until the sausages swell and all of the vegetables are cooked through, checking the pot every 10 minutes and adding more water if the stew gets dry, until it has cooked for about 30 to 40 minutes. Season the stew with salt and pepper to taste and sprinkle the top with the oregano before serving. It is very simple and quite tasty. The sausage and beans go very nicely together and the peppers and onions help round it out with the poblano giving it just a hint of heat, which is nice. I think this would be even better with kielbasa or a smoked sausage instead of the Italian sausage, but it all works really well together and gives you a nice one pot meal in under an hour that does not take a lot of work. If you have leftover Italian sausage they are perfect for this meal (which is what I did) but if you don’t you can cook some up quickly before putting them in with the other ingredients. I really liked the beans used in the recipe, but you could use other beans if you prefer them as well. Very often when I make chili I only use ground turkey to do it. We like the flavor of the chili and there is less fat and grease to deal with during the cooking process. I was looking for a recipe that would be just a little bit different from the standard recipe I have been using for years for chili when I cam across this one at myrecipes.com. There are just some slight differences in this recipe from the one I normally use, but you can adapt this recipe to make it as hot or as mild as you would like. Heat the olive oil in a Dutch oven over medium-high heat until the oil is shimmering. Saute the onion, bell pepper, poblano chile and the garlic, stirring often, until the vegetables begin to soften, about 5 to 6 minutes. Add the ground turkey, increase the heat to high and cook, stirring often and breaking the meat into chunks until the meat is no longer pink, about 4 to 5 minutes. Stir in the diced tomatoes, the black beans, tomato paste, chili powder, ground cumin and the agave nectar or sugar. Bring the chili to a boil, stirring often. Reduce the heat to a simmer and cover, stirring occasionally, and cook until all the flavors are blended, about 45 minutes to 1 hour. Stir in the lime juice. Check the seasonings and add kosher salt if desired or necessary. Serve the chili with shredded cheese and sour cream. 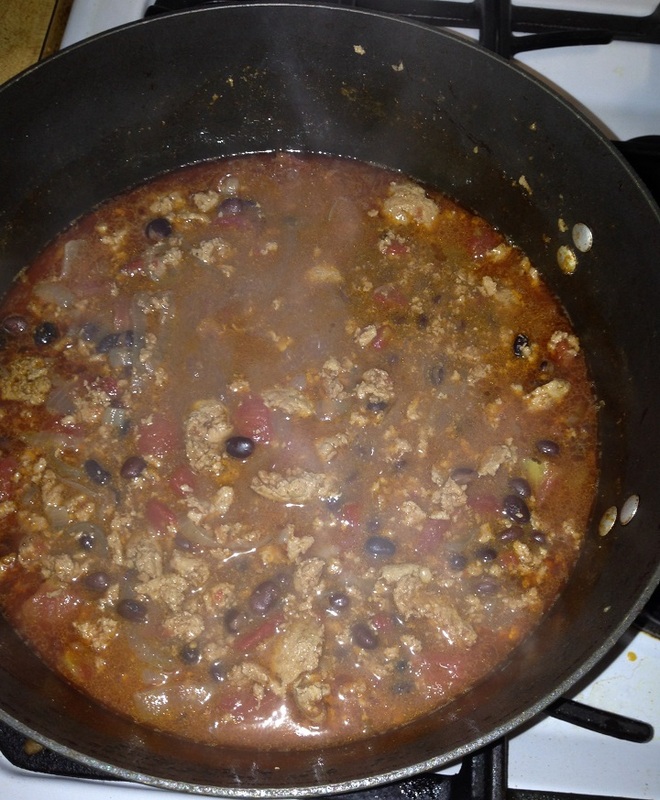 This recipe carries a little more heat to it than the one I had made in the past, thanks to the poblano pepper, but I really liked it and so did Michelle, who is the real chili lover in our family. You can always leave out the poblano if you prefer to have it a little milder. I used the sugar instead of the agave nectar because that is what I had on hand and it did help to cut down the acidity of the tomatoes. The lime juice really adds to the dish as well. I also seasoned the ground turkey before putting it in the chili with some Montreal chicken seasoning for some extra flavor because I find that ground turkey alone can be kind of bland, even in chili, but you can always season it in another manner if you choose or not at all and I think you will still get pretty good flavor out of this recipe. Of course, the flavor gets even better after a day or two and it has been great for lunches or even just as a snack with some tortilla chips.